I keep on being told by optimistic brokers that the market's bottoming out yet I keep receiving news of further price cuts, the latest being from Chris Chumley at Northrop & Johnson of a $200,000 price drop on his central listing, the 25m motor yacht Excellence. 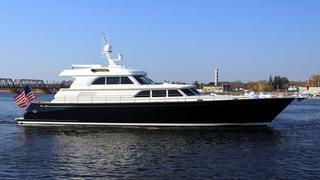 Built by Lyman Morse in 2004 to a Ward Setzer design, Excellence is the third and largest launch in the yard's Magpie series. Accommodation is for six guests in three staterooms and twin 1000hp Caterpillar engines give her a range of 700 nautical miles. Lying in Old Lyme, Connecticut, Excellence is now asking $3.7 million.